Starch is a carbohydrate (polysaccharide) consisting of a large number of glucose units. It is found in the storage organs of many plants. It is the main energy component of most staple foods, including cereal grains (wheat, maize, barley, rye, rice, oats, sorghum, millet), roots and tubers (potatoes, cassava, sago, arrowroot) (Daniel et al., 2007). It is also found in many legume grains (peas, faba beans, common beans) and in some fruits. In the cell, starch is stored in amyloplasts and forms starch granules. Starch is arranged in two types of macro-molecules: amylose (linear and helical polymer) and amylopectin (branched polymer). Amylose is usually dominant but high amylopectin varieties (mutant waxy maize) or subspecies (e.g. the glutinous rice, Oryza sativa var. glutinosa) exist. High amylose cultivars have been developed (Schwartz et al., 2009). In addition to its major role as a source of energy in staple foods, starch has long been extracted by humans for food and non-food purposes. In ancient Egypt, an adhesive made from wheat starch was used to cement strips of papyrus. A complete procedure for starch production was given in a Roman treatise by Cato in 184 BCE (Schwartz et al., 2009). Today, the main starches are obtained from normal maize, waxy maize, high-amylose maize, cassava, potatoes and wheat. Rice, including waxy rice, peas, sago, oats, barley, rye, amaranth, sweet potatoes and other exotics are local sources of starch (Chiu et al., 2009). Starches have many applications in food industries (e.g. confectionery, bakery, sweeteners, polyols, amino acids, brewing, distillery, soft drinks...), in non-food industries (e.g. textile, pharmaceuticals, paper...) and as a feedstock for the production of fuel grade ethanol (Crawshaw, 2004; Schwartz et al., 2009). 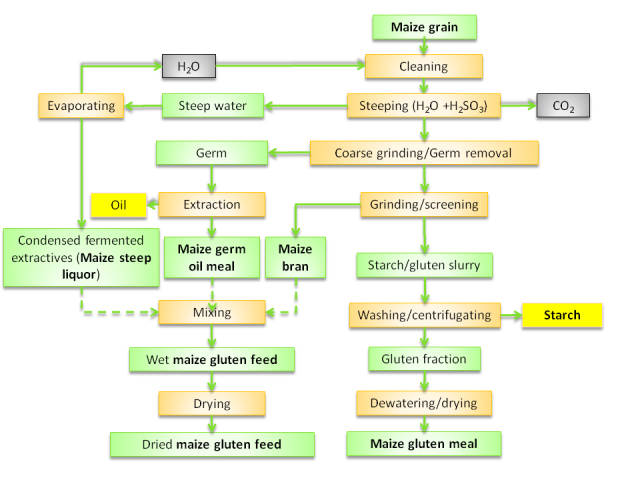 While valuable both as a source of energy and for their various physical functionalities, native and modified starches (see Processes below) are not widely used in animal feeding outside specialty feeds, such as pet food and milk replacers, since most feeds already contain grains. Pregelatinization makes starch readily soluble in cold water and suitable to replace lactose in calf milk replacers (Maningat et al., 2009). Starches play an important role in semi-purified diets used in animal feeding trials, where it is necessary, for instance, to adjust separately the energy and the protein content of the diet (Fuller, 2004). 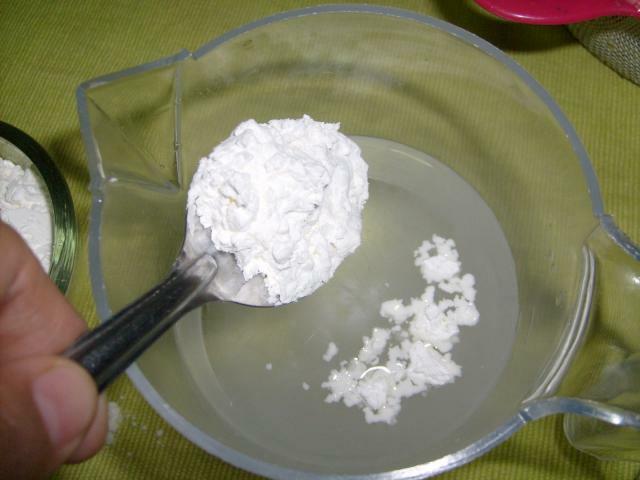 Pregelatinized starch and high amylose starch are particularly useful for their binding properties in the pelletization and extrusion processes (Maningat et al., 2009). Worldwide starch production increased from about 48.5 million t in 2000 to 73 million t in 2011 (AAF, 2013; LMC, 2002). The USA is the main starch producer (51% of world production) (AAF, 2013). Maize is the main source of starch (over 80%), followed by wheat (8%), potatoes (5%) and cassava (5%). The USA mainly produces maize starch while the EU produces wheat starch and potato starch (ZFT, 2013). Starch is extracted from grains by the wet-milling process. The first step consists in cleaning, steeping, grinding and removing some of the non-starch components of the grain (germ, bran, protein layer). In a second step, the resulting flour is mixed with water in order to remove gluten, yielding crude starch milk. Starch milk is then dewatered in hydrocyclones (Daniel et al., 2007). Starch extraction from roots and tubers starts with cleaning and rasping the raw materials in order to break the cells and release starch granules. The resulting slurry is a mixture of pulp (cell walls), juice and starch. Sulphur is used to prevent oxidative browning of the juice. Powerful washing is used to flush the granules out of the cells. The pulp is retained on sieves while the slurry (starch and juice) is removed for subsequent refining. The slurry is sent to hydrocyclones to separate starch from water and fibre on a density basis (Daniel et al., 2007). Once the starch is extracted, it is dried and often processed to obtain specific functional properties (Daniel et al., 2007). Because raw starches are unsuitable for most applications, they must be modified by physical, enzymatic or chemical treatments to enhance their positive attributes and/or to minimize their defects so that they can function properly under specific processing or storage conditions. Modifications include high heat, high shear, low pH, freeze/thaw and cooling. A common modified starch is pregelatinized starch, a pre-cooked starch that can thicken (gelatinize) instantly in water. Other modifications include treatments with HCl, NaOH, KOH, hydrogen peroxide, sodium hypochlorite, phosphorous acid, phosphates, acetic anhydride, propylene oxide, etc. The properties required for a particular application, availability of the starch and economics play a role in selecting a particular native starch for modification (Shannon et al., 2009). Under certain circumstances, starch dust may represent an explosion hazard. Workers pouring sacks of potato starch and maize starch have been exposed to airborne dust in the range of 115-200 mg/m3 (OSHA, 2005). Repeated or prolonged contact with skin may cause dermatitis (NIOSH, 2004). Starch production is an industrial process that consumes energy and water, and yields wastewater and by-products. In 2012, a study carried out for the European Starch Industry Association concluded that, for the process leading to native starch (not including cultivation), the use of electricity and heat (the latter necessary for drying and concentration) were the major contributors to the carbon footprint, while water use was the main contributor to water depletion. Additives were not a contributor to the environmental impact for native starch, but did contribute to the impact for other products like liquid glucose. The study noted that the widespread use in Europe of cogeneration (combined heat & power) systems mitigated the effects of energy consumption and that waste production was reduced. Most starch by-products in Europe are indeed from plant sources, have an economic value and are not discarded or burned (Vercalsteren et al., 2012). Starch production from roots and tubers, which includes washing and peeling operations, requires particularly large quantities of water. For instance, the European potato starch industry release of wastewater has been reported to be equivalent to the wastewater production of 2.9 million people (Mikkelsen, 2006). In cassava production, a ton of starch generates approximately 10 to 20 m3 of wastewater with high organic loading (P 0.2-0.6 kg and N 3-10 kg) (DWI, 2006). A cassava starch production unit processing 100 t of tubers per day may output 47 t of fresh by-products, which may cause environmental problems when left in the surroundings of processing plants or carelessly disposed of (Aro et al., 2010). In Nigeria, for example, cassava wastes are mainly left to rot away or burned off to create space for the accumulation of a new generation of waste heaps, emitting carbon dioxide and producing a strong offensive smell (Aro et al., 2010; Adebayo, 2008). Cassava peels (high amounts of cyanogenic glucosides) and pomace (large amounts of biodegradable organic matter) may cause surface water pollution especially if they are stored under heavy rain or simply disposed of in surface waters (Pandey et al., 2000; Cereda et al., 1996; Barana et al., 2000). The presence of a large processor or of a high concentration of small processors can cause the eutrophication of slow moving water systems, notably during the dry season (FAO, 2001). However, cassava processing does not appear to affect groundwater supply, except perhaps in the immediate surroundings of processing units due to leachates filtering through the soil (FAO, 2001). Water depletion can be minimized by the adoption of processing technologies suitable for the water resources available (FAO, 2001). Generally, the long-term and broad-based impact of cassava processing on the environment can be corrected by proper waste management (FAO, 2001), and the use of cassava by-products as feedstuffs or as an alternative substrate for biotechnological processes in way to alleviate environmental issues (Pandey et al., 2000). Native starches contain mostly starch with residual amounts of protein, fibre, fat and minerals, though some feed-grade starches may have higher quantities of non-starch materials. The nutritional and functional properties of starches are linked to their amylopectin:amylose ratio and to the modifications of the starch granules resulting from processing. 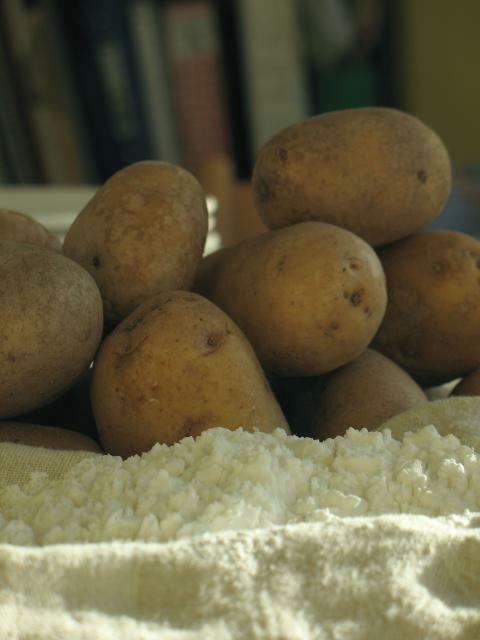 In non-mutant varieties, starch generally contains 20 to 25% amylose and 75 to 80% amylopectin by weight. Even in those varieties, amylose content varies widely within a single species, and the following ranges of amylose have been reported: maize 20-36%; sorghum 21-35%; wheat 17-29%; barley 11-26%; rice 8-37%; peas 34-37%; and potatoes 18-23% (Shannon et al., 2009). Starch is used as a source of carbohydrates and as a binder in calf milk replacers. While the newborn calf cannot digest starch, this ability increases during the first 2 months. Starch digestibility in calves depends on the botanical species: in 35-day old calves fed a diet containing 17% raw starch, maize starch (92% digestibility) and rice starch (93%) were more digestible than cassava starch (78%) and potato starch (59%). Processing may also increase digestibility, particularly for the lesser digestible starches or when starches are included at a high rate. For instance, the digestibility of pregelatinized potato starch in 35-day old calves fed 17% starch was 89% vs. 59% for the raw starch. Raw and processed starches can be included at 5-7% (diet DM) in the diet of young calves, and at 10% when mixed with other ingredients. In calves older than 2 months, this inclusion rate can be doubled or tripled when starch replaces part of lactose and lipids. Starch-rich calf diets may result in softer faeces, though this is not a sign of digestive problems. The replacement of part of the lipids with starch-rich ingredients is a way to increase the muscle percentage in the carcass, as well as the iron content and the colour of meat, without altering tenderness, juiciness or flavour (Veissier et al., 2003). Starch is potentially entirely digestible in the rumen, but its solubility and its digestion rate can vary largely according to the source of starch and the method of processing (Offner et al., 2003). The effective in sacco degradability (transit outflow rate of particles of 6%/h) of raw starch ranged from 60% to 94% for cereal grains and legume seeds: maize 60%; sorghum 60%; rice 67%; faba beans 75%; peas 79%; barley 89%; oats 93%; and wheat 94% (Sauvant et al., 2004). Processing cereal grains tends to result in large variations in starch degradability. Hydrothermic processes increase degradability: in maize, effective degradability increased significantly when the grain was expanded (68%), extruded (77%) and steam-flaked (86%) (Sauvant et al., 2004). But formaldehyde treatment decreased starch degradability in cereal grains that already contain highly degradable starch, such as barley (84 vs. 89%) or wheat (85 vs. 94%) (Offner et al., 2003). Though no data has been found on the degradation rate of native or modified starches, it can be assumed that it is higher than the corresponding value for the whole grain. However, it should be noted that in in sacco measurements the feeds are finely ground, making the starch a priori rapidly accessible to microbes. Because starch is rapidly digested and does not promote chewing and saliva recycling, it can induce acidosis in the rumen. Consequently, its inclusion must be limited in ruminant diets. While diets can contain up to 50% (diet DM), the total starch content in diets used in intensive production is usually about 30% DM. To reduce the risk of acidosis associated with dietary starch, it is recommended that the amount of degradable starch should not exceed 20% of the diet DM (Sauvant et al., 2010). The primary sludge (also called feed-grade starch) resulting from the processing of potatoes into chips, wedges or crisps may be a valuable slow-release starch for ruminants: 5 kg of feed-grade starch replaced 3 kg of rolled barley (Crawshaw, 2004). Starch can be used in milk replacers for piglets and has been tested as a prebiotic and as an energy source. Starches have been assessed as milk replacers in piglets. Piglets fed wheat starch between 7 and 14 days had lower weight gain and a worse feed conversion than piglets given lactose (Leibholz, 1982). Earlier experiments have shown that newborn piglets could digest raw maize starch (digestibility over 98%) and had less diarrhea than piglets fed on maltose, glucose or soluble starch (Cunningham, 1959). In 19-day old piglets receiving a complete diet where maize grain was replaced by 7 or 14% modified potato starch or by lactose, potato starch did not improve average daily gain, but feed intake increased linearly with increasing potato starch. In piglets fed a diet where modified (non-hydrolyzed or hydrolyzed) potato starches included at 12% replaced either maize or lactose, the piglets (0 to 21 days post-weaning) fed the diets where starch replaced maize had a higher average daily gain due to higher feed intake, but this effect was not observed when modified starches replaced lactose (Kerr et al., 1994). Raw potato starch has been tested for its prebiotic effect: including 7% raw potato starch decreased diarrhea during the post-weaning phase, and may thus help to reduce the use of antibiotics in piglets (Bhandary et al., 2008). Growing pigs were fed on 25% raw maize starch or 25% raw potato starch. The maize starch had higher OM, protein and starch digestibilities than raw potato starch during the first 23 days of the trial. However, after 38 days, digestibilities were equal for both starches, indicating that pigs can adapt to raw potato starch within 5 weeks (Martinez Puig et al., 2003). While starch is the main energy source in poultry diets, raw or processed starches are rarely used as ingredients and dietary starch is usually provided by plant ingredients. Starch content and its digestibility have a major impact on the metabolizable energy value of the feedstuffs, for example in wheat (Wiseman et al., 2000). Variations in digestibility are mostly attributable to the structure of the native starch, which depends on its botanical origin. Chickens have evolved to be particularly adept at coping with extremes in amount and sources of starch (Moran, 1985), and inadequate levels of pancreatic α-amylase are unlikely to cause digestibility issues (Wiseman, 2006). Some semi-purified starches have been tested on poultry. Digestibility values obtained in cockerels and young birds were high (99%) for wheat and cassava starch. Starches from peas and common beans were less digested, mainly in young birds (94 and 78% respectively), and potato starch was poorly digested whatever the age of the bird (70 and 39% in adult and young birds respectively) (Yutste et al., 1991). Starch has been further studied as a component of common feed ingredients. The digestibility of wheat starch, and consequently the ME value of wheat, depends on grain hardness, as the starch of hard wheat varieties is less digestible than that of soft ones. Wheat starch digestibility also depends on the amount of non-starch polysaccharides (arabinoxylans) that increase digesta viscosity and generally reduce absorption (Carré et al., 2007). The same phenomenon can be expected in barley and rye, which are rich in non-starch polysaccharides. However, wheat α-amylase inhibitors appeared to have no effect on starch digestibility (Rogel et al., 1987). Maize starch was highly digestible by birds (over 95%) (Weurding et al., 2001). Among legume seeds, pea starch was slightly less digestible, notably when fed in coarse particles (Carré et al., 1987). Spending energy for processing peas (fine grinding, pelleting, extrusion) increases starch digestibility (Carré et al., 1987; Carré et al., 1991; Al Marzooqi et al., 2009). Purified maize starch is a potential source of energy in rabbit nutrition. It is generally used in experimental diets to adjust the digestible energy originating from dietary starch without altering the protein or fibre composition of the diet. The inclusion rate of maize starch is often comprised between 10 and 20% for growing rabbits and breeding does (Arruda et al., 2000; Lebas et al., 1996), though this proportion could be increased up to 35-40% without problem (Colin et al., 1978; Gidenne, 1992; Amber, 1997). Faecal digestibility of purified maize starch is very high: from 99.3 to 99.9% depending on the experiments. It is slightly higher than that of maize grain starch which is 98.9-99.0% (Blas et al., 2010). The difference in digestibility between purified maize starch and maize grain starch is more important at the end of the ileum, i.e. at the entrance of the caecum. For example, digestibility is almost complete (99.2%) for purified maize starch but only 97.2% for starch of maize grain in similar conditions (Amber, 1997). As a consequence, the effect of purified maize starch on caecal microbiote evolution is very limited, contrary to that of starch introduced in the diet in the maize grain (Blas et al., 2010; Arruda et al., 2000). In common carp, a diet containing 41% potato starch had a slightly lower energy digestibility (85 vs. 90%) than diets containing maize starch or wheat starch. Growth and feed conversion efficiency were not influenced by starch source. The DM, fat and energy content of carp given potato starch was significantly lower than carp given maize starch or wheat starch (Schwarz et al., 1993). The high inclusion level (35%) of maize starch (pregelatinized or not) in Nile tilapia diets had a positive effect on diet digestibility and fish growth. Also, including pregelatinized starch in the diets increased faeces viscosity and thus facilitated faeces removal from fish ponds, reducing the negative impact of faecal waste on water quality and on the environment (Amirkolaie et al., 2006). In Nigeria, cassava starch included at 2% as a binder in aquaculture diets was found to be a better replacement for carboxymethyl cellulose than rice starch and sorghum starch (Adebayo et al., 2003). Veissier, I.; Bertrand, G.; Toullec, R., 2003. Le veau de boucherie. INRA Editions, 224 p.